If you were born on January 28th, your birthstone is the deep red garnet (though garnets can be found in many other colors than deep red) and you were born under the sign of Aquarius. Oh, and have a Happy Birthday! A few more minutes of daylight! It was sunny yesterday and it seemed as though the sun didn't set forEVER. Well, that's an exaggeration. The sun continues to set a bit later every day. We have 9 hours, 53 minutes, and 52 seconds of daylight today, so we've added back 45 minutes and 56 seconds of daylight since the Winter Solstice on December 21st. Countdown to Daylight Savings Time as of 4 p.m. January 28, 2018. Sunday, March 11, 2018, meaning we have 42 days of these early evenings until sunset in Chicago, today at 5:00 p.m., jumps to 6:52 p.m. We will then have 1 hour and about 50 minutes more daylight in total than we have now-- and 2 hours and 36 minutes more daylight than we had on the Winter Solstice on December 21, 2017. Charleston, South Carolina? Paris, France? New York City? Other Cities? New York City, slightly south of Chicago, has 9 hours and 59 minutes of daylight, about 6 more minutes of daylight than we have in Chicago. Charleston, South Carolina, where people were astounded earlier in the month by inches of SNOW, is fairly far south. Charleston has 10 hours and 31 minutes of daylight today, about 37 more minutes of daylight than Chicago. The space shuttle Challenger blew up on this date in 1986, taking seven astronauts, including the first "teacher in space", Christa McAuliffe, to their deaths. I remember the day very well. I was working when co-workers came in with the news. We watched and speculated all day as to what might have happened. The shock was extreme; we were used to space shots as routine by that time and never expected any kind of tragedy. Other January 28th deaths listed HERE. 1547 9-year-old Edward VI succeeds Henry VIII as King of England. 1754 Horace Walpole, in a letter to Horace Mann, coins the word "serendipity". 1813: Jane Austen publishes Pride and Prejudice anonymously. 1820: Continent of Antarctica is discovered. 1958: Lego brick is patented. 1973: Vietnam War cease fire goes into effect. 1990: Romanians take to the street to protest the government of Iliescu. Assuming that you aren't a Jane Austen fan and therefore won't celebrate the publishing of Pride and Prejudice with a Jane Austen party, you may wish to check out the following events from the National Day Calendar. The National Day Calendar lists many interesting (and some weird) "celebrations" for each day. For January 28th, they list National Fun At Work Day (since it is Sunday, that "fun at work" may mean that you AREN'T at work and therefore can do something fun! ), Data Privacy Day, National Kazoo Day (! 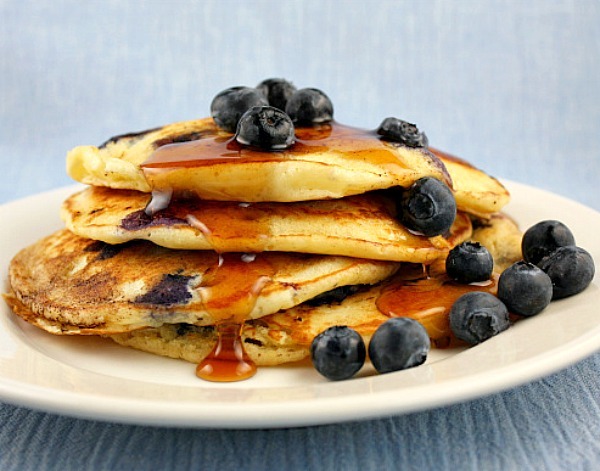 ), and, perhaps most important, National Blueberry Pancake Day! Here's a hint: Add the blueberries either immediately AFTER you've poured the batter onto the hot griddle, or immediately BEFORE you pour the batter onto the hot griddle. This will prevent your pancakes from turning blue. And remember that blueberries are really good for you! Here's a great blueberry pancake recipe from someone named Todd.